Marina Park - CEO, Girl Scouts of Northern California, lawyer and mom pens a column in The San Francisco Chronicle's City Brights about Girl Scouting. 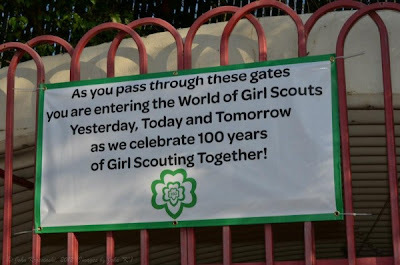 This week's column reports that this past weekend over 20,000 Girl Scouts, from 38 states, Brazil, Canada, China, South Korea and Spain, celebrated Girl Scouts’ 100th Anniversary at One Hundred, Fun Hundred under perfect sunny skies and a super moon, at the Alameda County Fairgrounds in Pleasanton. "Last winter, when I walked the Fairgrounds with the core team of Girl Scouts of Northern California volunteers and staff planning the event," writes Park, "I thought they might be just a little bit crazy – but crazy in the best sort of way. They pointed out 6,000 square foot exhibit halls that, for one day, would be transformed into a museum and shop, cavernous exhibit halls that would become archery ranges, BB gun ranges and hands-on science museums, a giant corral that would hold an 85 foot-long replica of the Golden Gate bridge, a front lawn area that would become “GirlTopia” with zip lines, a Radio Disney sound stage, a huge field that would become Camp S’more (complete with llamas and a huge craft project involving the creation of 12 beautiful mosaics depicting outdoor life), a courtyard that would house a temporary swimming pool for scuba lessons, a parking lot that would feature 4 rock climbing walls and U.S Tennis Association tennis courts, and an amphitheater that would host celebrations for girls who earned Girl Scouts’ highest honors this past year – the Bronze, Silver and Gold Awards — and lots of entertainment, including a girl-planned 2 hour closing ceremony and a walnut grove campground that would be home to 4,000 campers." On May 2nd, the event sold out. On Friday May 4th, the 4,000 campers arrived and enjoyed a campfire sing-along and star-gazing. 9:00am Saturday morning the gates opened for the one day event – two years of planning, two thousand volunteers and 20,000 participants. "And, it was awesome," writes Park. "Yes, there were some lines, but there was a magic energy in the air from start to the girl-planned closing ceremony and fireworks display at the end. I was on my feet for about 16 hours on Saturday, and I only saw a small fraction of everything that happened."